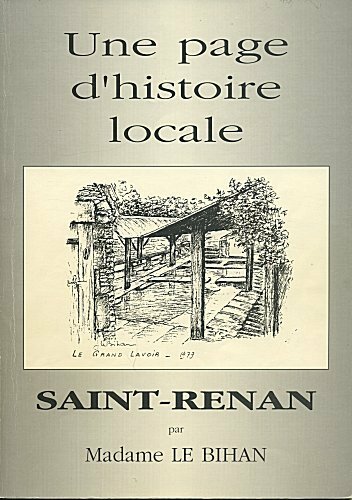 Access:	Park in the center of Saint-Renan on the Place du General Leclerc and walk down the "St-Yves" street to the Place of "Vieux Marché". Cardinal House is at the back, on the right side of this square. It's not about a cardinal's house. As for the neighboring Gérard house, the residence takes its name from that of its owner at the time of its inscription as a historical monument. This half-timbered house1 is the most beautiful house in the Iroise country. From the outset, it attracts the eye both by its originality and its medieval architecture. Original, it is undoubtedly with its roof overflowing widely above its second floor, such as the visor of a cap. 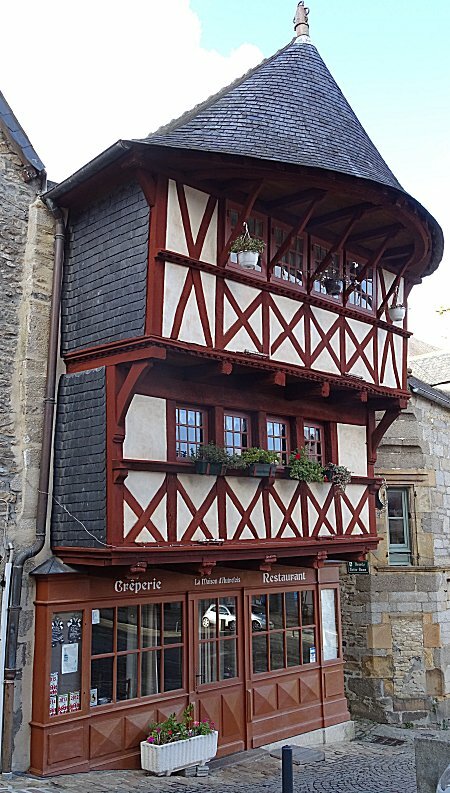 It is only in Morlaix that we find this type of roof coverage. 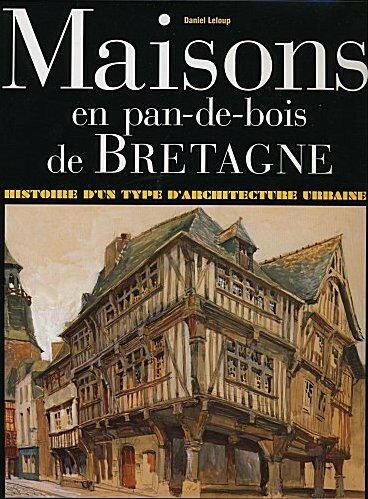 Medieval, its pretty gable2 half-timbered and corbelled floors inevitably place it at this time in the eyes of the walker. However, its construction dates back to the end of the XVth or the beginning of the XVIth century, so after the end of the Middle Ages, like the house Gérard which, by its aspect, belongs well to the Renaissance. The builder undoubtedly wanted the architecture of his new house to fit fully among the medieval houses that surrounded the place at the time, and is even the most beautiful of them. We do not know the name of this man. At most, it is known that a certain Georges Charles, Sir Kerincuff, was the owner of the house, as of many others in the city, in 1625. 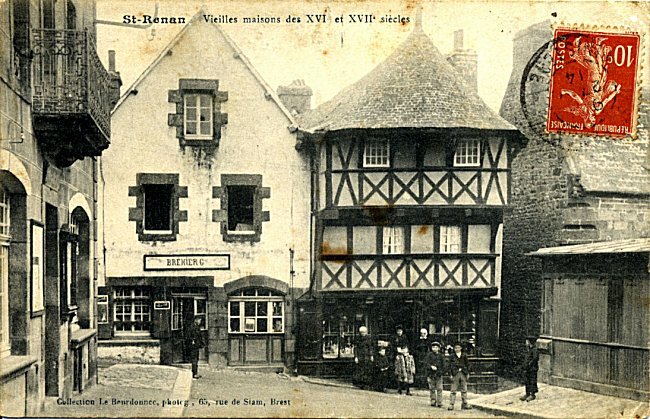 Sold by his heirs in 1688 to a surgeon named Sebastien Deville, the Cardinal house has been maintained to this day by its successive owners and was the image of Saint-Renan on many postcards. The commerce of its ground floor has always benefited from the proximity of the market and the old halls that covered the square. 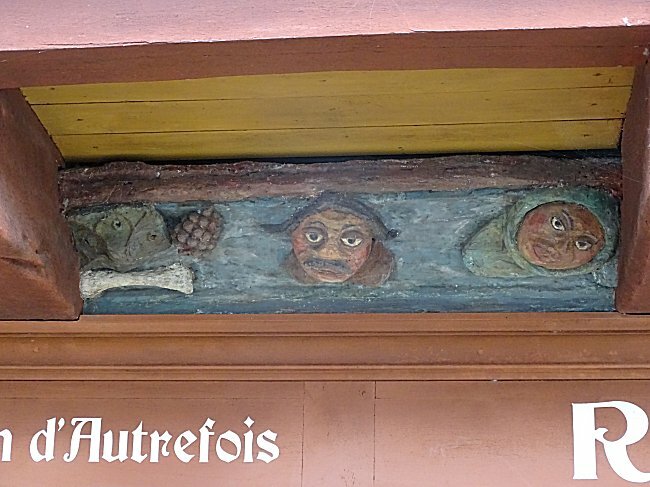 We must imagine that in the Middle Ages customers did not enter the shop. Horizontal shutters pulling outward formed the counter, the display and separated them from the vendor. 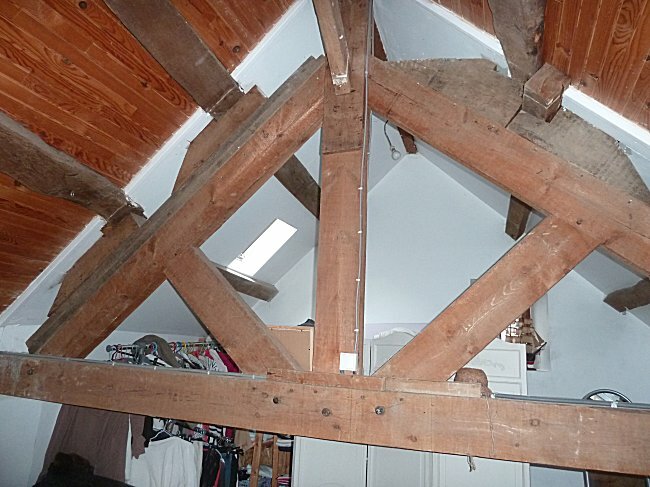 It will be noted that the overflowing parts of the floors as well as the cap of the roof rest on projecting beams and legs of force which had to undergo a restoration first in 1989, then in 2011. As for the cap, it is in fact a pointed roof, like that of a tower, that is damped by a ridge of sandstone ridge. 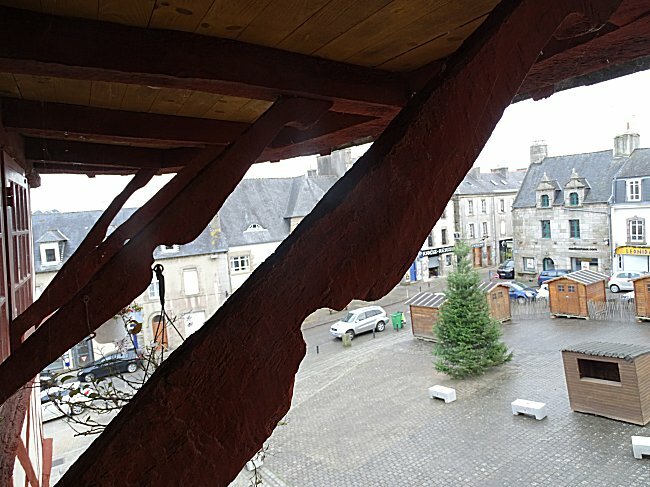 In front of the windows of the second floor, the struts support its overflow over the square. You have to get close to the window and look up to discover the real treasure hidden in the facade of this unusual house. 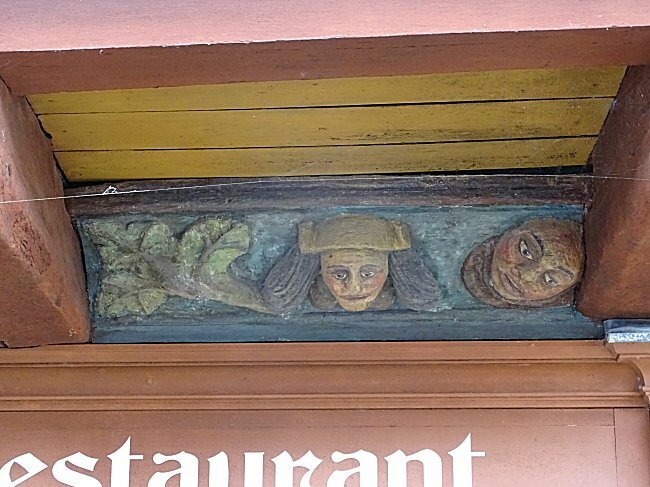 It is a complete surprise: A magnificent frieze carved in polychrome wood awaits customers of the creperie. On its four parts, seven grimacing faces alternate with a bone, plant elements and a threatening dragon. It is unclear if these faces are the fruit of the artist's imagination or if he caricatured well-known people of the city in his day. Some are hooded. We believe we are in the middle ages and this unexpected decor evokes polychrome sandpits crafted for Breton churches and chapels. The comparison with religious elements is not insignificant: some claim that this frieze represents the seven deadly sins. Will you recognize these caricature faces, pride, greed, envy, anger, lust, laziness and gluttony ? 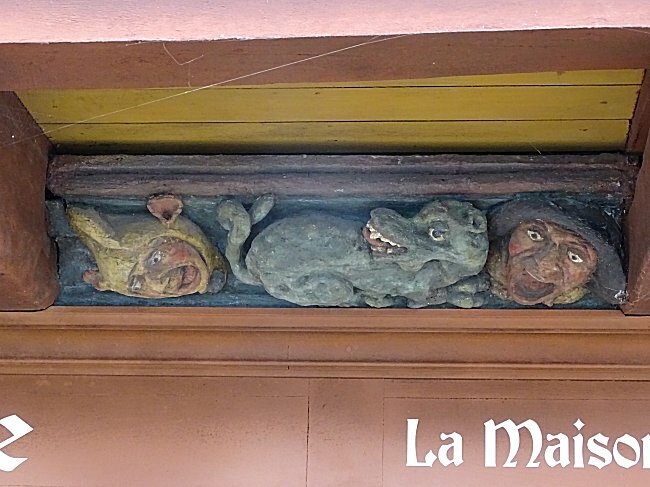 - The faces would be caricatures of well known St-Renan inhabitants at the time and the reptile would be a salamander, the emblem of King François the 1st who visited St-Renan in September 1518. - The sculptures represent a story of dragon that we know it was told at the time in the region of St-Renan4. - The house would have been a hostel and the sculptures would indicate that one could sleep, of course, but also eat, play, listen to scary stories and receive the services of particularly welcoming women. Dogs would even be admitted. As it is probable that we will never know what the true explanation is, it is up to each one to choose the one that seems most likely to him, or to imagine another one. Other remarkable houses are visible in St-Renan. The Tourist Office organizes guided tours of the city every Thursday in July and August. Departure at 9:45 AM. Do not hesitate to ask for information. -1- Half timbered houses: see the corresponding Wikipedia page. 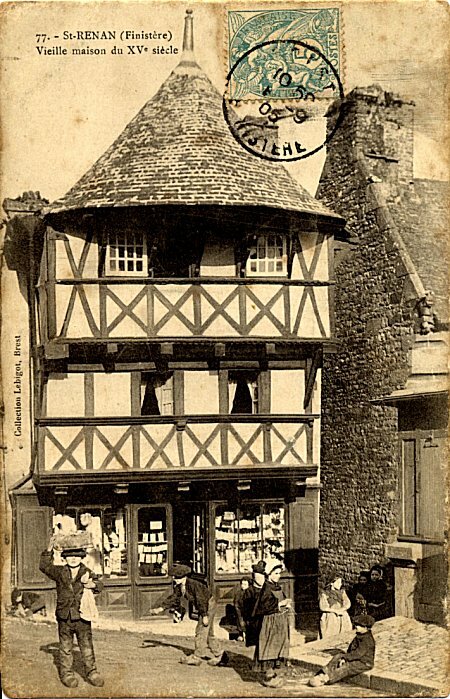 -2- As was customary in the Middle Ages, and as we can still see on neighboring houses, it is indeed the gable of the house overlooking the street. It was not until the great fire of London that a royal ordinance of 1667 intended to limit the spread of fire in the city forced the architects of the new buildings to direct the gables to the neighboring houses. "Having the gable facing the street" then became synonymous with privilege and opulence (i.e. "Being established"). Since then, in a few centuries, our townhouses have rotated a quarter of a turn. 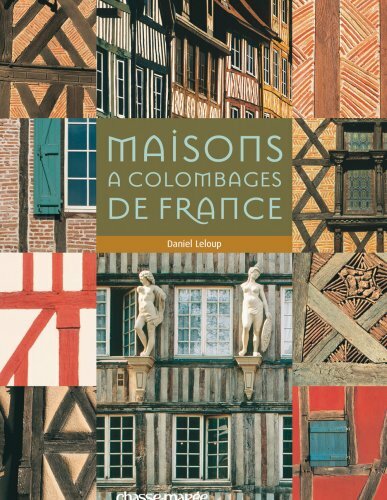 -3- According to Mr. Daniel Leloup (see the books below), the cover of the pinion in the shape of a cap is at least a century later than the construction of the house. This is an ephemeral fashion specific to Leon, which makes it all the more interesting. "In the middle of the ruins of the castle, there is a big hole whose depth is not known. There is a treasure, but woe to anyone who would want to make sure of it, because a huge snake is lying on it and is good guard. A few imprudents had already descended and had fallen prey to the reptile, when some thirty years ago, one of the miller's sons of the time wanted to brave the danger. Followed by some friends, he descended into the hole after long prayers and great signs of the cross. The hope of becoming rich supported them. However, as they advanced, their courage diminished and soon gave way to fear. They retreated. Our heroes had dodged in time! And they showed their scorched hair, their burned clothes. How to question their veracity? Everyone believed them or did not contradict them. Since then, nobody has tried to go in search of the treasure. " 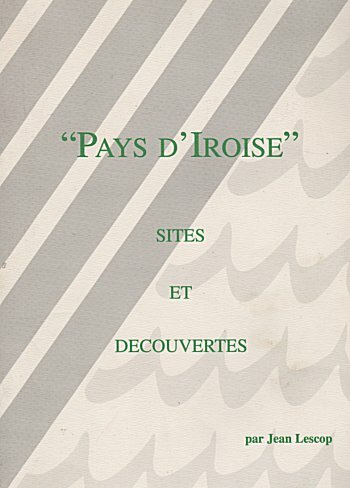 Excerpt from: Jeanne Le Bihan, Nos vertes randonnées, Tourist Office of St-Renan, 1982. (according to Le Vot, 1875). 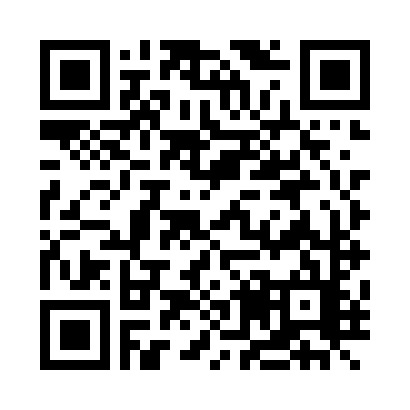 Thanks to Mr. Jos Saliou and the association "Musée du Ponant" he chairs for their help and loan documents, and Mr. Daniel Leloup who kindly check the content of this page. 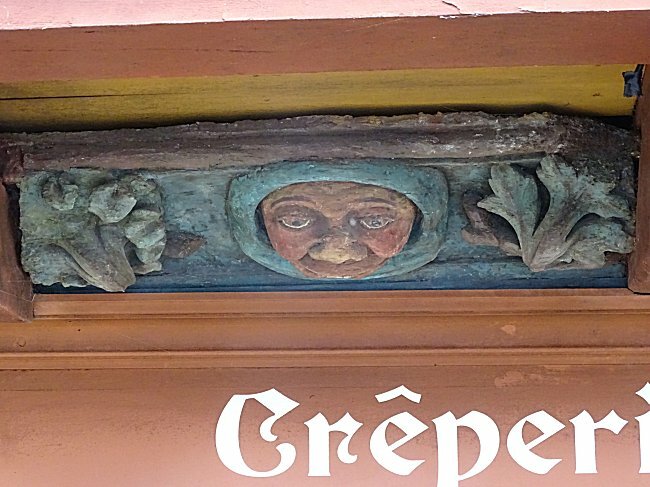 Thank you also to Mrs. Barnabé, for opening the doors of her beautiful crêperie and allowing to take pictures of the frame. 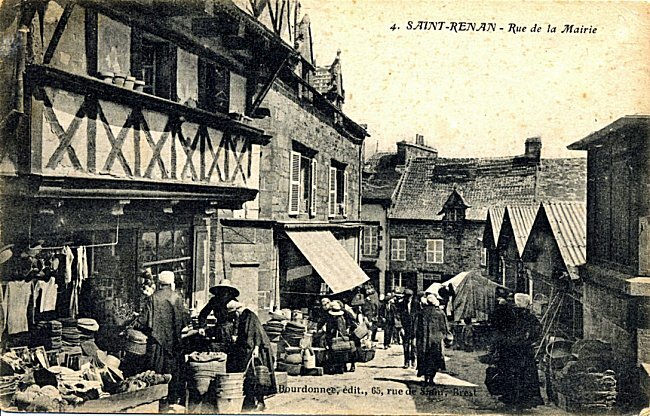 On the heritage of St-Renan: visit the Ponant Museum at the top of this square and its website . See also the page we devoted to this museum	.